Everything up to this point, one could argue, is all just about... temptation. Saw some Alpha-Capricornids from Balsam Lake Provincial Park while camping with Laurie and Care. "My birthday suggestion was a telescope. I have looked briefly at them. I want an equatorial mount and I think I want a motor drive. This range is probably around $600 to $700. I suggested to Mom that everyone pitch in. 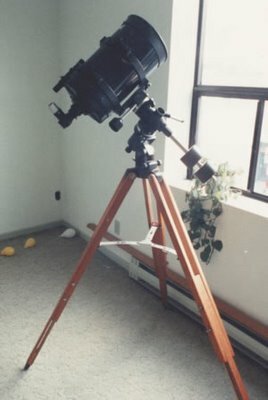 It's something i really want..."
Visited the David Dunlap Observatory in Richmond Hill (same night as the June Lyrids peak). Cool place! Booked a tour of the David Dunlap Observatory. Talked to Mom about telescopes. The following items are listed in reverse order. Hopefully, that's not too confusing. 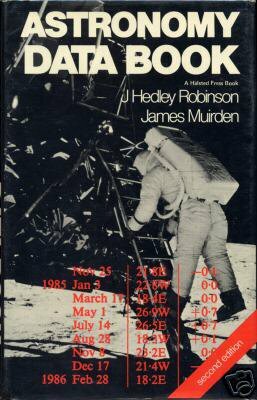 I'd regularly transcribe interesting events from the RASC Observer's Handbook, into my daytimer, paper or electronic, so to keep tabs on things through the year. I'd often note the date of Starfest. Wondered what it would be like to go... Camping and astronomy at the same time! NASA had scheduled a test firing of the main engines on 24 July 1988. This was delayed to August 11. But it went well. We can get back on the horse again. 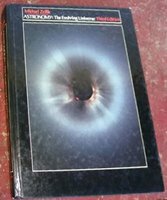 Wandering through a book store (Edwards) in the 'hood (Yonge & Eglinton) sometime in 1988, I found The New Atlas of the Universe by Patrick Moore deeply discounted. I snapped it up the tome. The Space Shuttle Challenger exploded during take-off on 28 January 1986. This disturbed me a great deal. Bushnell 7x50. $49.95. 22 Nov 1984. Paid with credit card. From Black's Cameras. In Burlington, Ontario, I believe. I took an Astronomy course, SCI238?, at university, also encouraging a couple of my friends to join. That was around '83 or '84. It was not a "bird" course; there was a lot of fairly heavy math and theory. We studied from the third edition of ASTRONOMY: The Evolving Universe by Michael Zeilik from Harper & Row. I became an impromptu tutor for my friends. I was doing my own drawings and illustrations of space and space craft... This pencil crayon and enamel on paper work is circa April 1982. My parents gave me (during the 1981 Christmas) the National Geographic astronomy "SpaceKit." 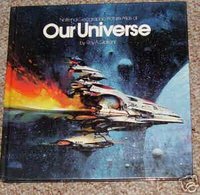 It included a nice book, Our Universe by Roy Gallant, a vinyl record!, a very good planisphere (that I still use today), and a funny little 'scope (made of cardboard) for viewing colour slides. From the St. Thomas public library, I happened upon the astounding Galaxies by Timothy Ferris, in hard cover. Large format and quite heavy. I really enjoyed this book, particularly the chapters on anti-universes and time dilation. I love the photography. Years later, Mom would give me the soft cover as a Christmas gift. Wow! Started following the Canadian band FM, and separately Nash the Slash, after the release of the Black Noise album, in the late 70s. Phasors on Stun, Black Noise... great songs. In 1980, I remember watching the Cosmos documentary on a PBS TV channel with the family. The visuals left an impression. And I clearly recall the discussion about the Drake Equation, estimating other possible sentient species in our galaxy. I was into the artist Vangelis, so I enjoyed the music in the series! Mom later gave me Carl Sagan's Cosmos book from Random House for a 1982 Christmas gift. I was teaching myself a lot about the planets and solar system and deep sky objects during high school, on my own time, at home. 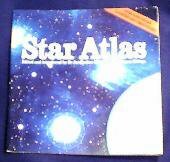 I bought my first charts on 29 Jul 79, the Star Atlas by Drs Jacqueline and Simon Mitton from Prentice-Hall of Canada. On examining some old notes from 1978, I see I was cataloging new planets, asteriods, etc. I created detailed profiles for each planet and for Jupiter and Saturn profiles of the big moons. Found charts for the Greek alphabet! 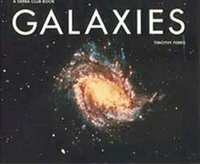 I noted that the second Omni magazine had an article about the current estimated age of the Universe: 13.5 to 15.5 billion years. Good to know. I built a lot of models too. I still have my NASA Apollo Saturn V rocket; actually, it resides in Mom's game room. By August 1978, I had 12 completed models of spaceships or ships from SF shows. 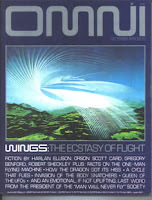 Beginning late 1978, I began purchasing Omni magazine, from the Guccione (nee Penthouse) clan. I quite faithfully bought every issue for the first two or three years. I still have a number of issues, in storage. I remember watching a program on television called Cosmic Christmas. Rather enjoyed it, at the time. The boy. And his pet goose. And I kept hoping to catch it again. But it seemed to be a one-hit wonder. I kept numerous clippings of the Voyager I probe. Here's an article from a local paper the day after the launch (5 Sep 77). During the summer of 1977, the family traveled by road trip from Ontario to British Columbia (and back through the northern states). On 13 Jul 77, we visited the H.R. 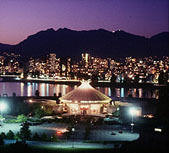 MacMillan Planetarium in Vancouver. We watched the "Journey of the Planets" presentation. 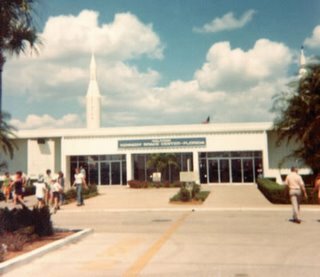 On 19 Mar 76 the family visited the NASA Kennedy Space Centre (KSC) in Florida. What a place! We wandered through the visitor information centre. Mom bought the requisite postcard of the famous Christmas Eve 1968 photo of the Earth from above the Moon. The new "shuttle" plans were interesting. Then we took the 2½ hour bus tour of the grounds. 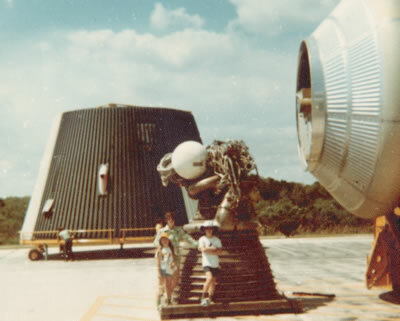 It was so cool seeing the actual space craft, like the Saturn V, on the site. Rocket motors are big. 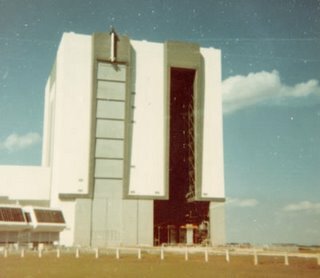 And the VAB is huge. I remember feeling incredulous that we were standing beside the mammoth Vehicle Assembly Building. Received my nature merit badge for Astronomy (among others) while in Cubs. I remember a segment in a grade 5 or 6 class on the solar system... That must have been around 1973. I think this is where I first became enthralled with the scale of things, how far away the planets were. And I think this is when I started to wonder just how Big the Universe was. And where the edge of it was. And what was outside of it. Had a flashback. I remember a class field trip from the Cedarbrae Village public school to the University of Waterloo's observatory. I must have been in grade 4 or 5 or 6 (so was 9 through 11 years old). I remember it was a sunny day. We were on a roof top somewhere. I remember a structure, possibly a dome. I think we looked through a telescope. But I don't remember what I saw... The sun through a solar filter? Regardless, that might have been, circa 1973, and probably my first look through a telescope! Summer family trip to the eastern provinces and Maritimes, July 1971. I clearly remember the road dust billowing up behind the car as we travelled through Prince Edward Island. I vaguely remember a great number of covered bridges. And I'll never forget walking on the beach of the Bay of Fundy while the tide was out. And knowing the water would go over our heads with a particular configuration of the Moon and Sun. I don't know when I got it. There's a recollection that I bought it at a yard sale or garage sale. At any rate, I have We Reach The Moon by John Nobel Wilford. It is in good shape. Copyright 1969. I have a third printing. I don't remember seeing it at the time, in 1968. It would be years later that I discovered, and fell in love with, Kubrick's 2001: A Space Odyssey. 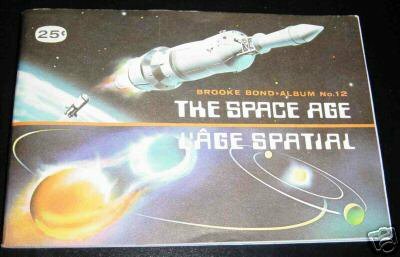 In 1969, the Brooke Bond book The Space Age came out (for 25¢). You'd collect cards from Red Rose tea boxes and place them in the book. I remember living in Orangeville, Ontario and anxious when Mom brought home a new box of tea. I still have my book! It's missing a few cards. Maybe I should try to finally finish it. It paints a very romantic picture of outer space. Of course we were right in the middle of the Space Race. I don't remember it directly. I would have been 5+ years old. But I know we were 4 of the 700,000,000 watching Neil and Buzz step onto the Moon as Michael orbited above. I've since seen the video so many times and read and viewed so many words and images that recollection was that I was there and seeing it with the rest of the planet. In an effort to get me to read more, and improve my reading ability, my Mom introduced me to science fiction (SF) books. I read a lot of Arthur C. Clarke. And she sat me in front of the TV during SF programs. Part and parcel was what was big on TV then: Star Trek (The Original Series). It ran from '66 to '69. Freakin' spammers! I've disabled comments because of system abuse. Your (legit) comments are welcome though. But you'll have to send them to me by email or some other means... I apologise for the inconvenience. Kill the spammers, kill them all.